Are you ready to embark upon a vision quest journey to refine and uplift every facet of your life? Come with me to a magical realm, where you will meet 13 amazing Wise Women master teachers who will inspire, enlighten , educate and guide you to create a Simply Enchanted Life of wholehearted self mastery, well being, grace, bounty and beauty. This course is partly self-guided, with a private facebook group for questions and a weekly live q&a with Rhianne. You can join in anytime. A course of self discovery that teaches the Art, of living from the heart. My name is Rhianne , I am your Heart Wisdom Way Mastery teacher and facilitator, and the author of Discovering Enchantment. I will be your guide to discovering the enchantment, wonder and wisdom that resides within your heart. My new course, based on my exciting Enchanted Heart Wisdom Oracle, is a journey that is going to shift your life in so many positive ways. You will increase your love and appreciation for yourself and life dramatically, hone your intuitive and visionary skills, gain clarity about your life path, inspire the creative spark, experience your visions manifesting and so much more. This course is designed in four sections , with three parts to each one. The concept of the course, is that we will be going to a magical land called Gwynaelwyd, ( gwin-all-wood) which is a word that came to me in meditation and means “Holy Blessed Homeland”. I believe we are all seeking the feeling of being at home with our lives. This course is a true home coming to yourself. In Gwynaelwyd you will be meeting The Enchanted Heart Wisdom Council, a circle of 13 wise women master teachers, who will each guide us to discover wisdom in all areas of life. They are magical wise women and each has gifts to share, including journal pages, downloadable art, altar cards and more. More details will be shared later, for now, I am delighted you will be joining us in Discovering Enchantment. The Enchanted Heart Wisdom System is a tool of transformation that allows you to access your Heart’s Desires and bring them to actualization. This system was conceived , gestated and born by Rhianne T. NewLahnd who gathered and compiled 25 years of experience, research and spiritual practices to come up with a tool of transformation that would help inspire and re-enchant people , restoring love for life. Connection to the wisdom and magic of the Divine or Sacred Feminine is the foundation of this work, which teaches us to trust in the wisdom of the heart. Rhianne has facilitated hundreds of women’s circles, ceremonial initiations, private oracle and healing sessions, written thousands of pages of channeled guidance and maintains and ongoing desire to create and contribute powerful, beautiful and effective offerings that contribute to the betterment of our world. Rhianne specializes in creating methods of transformation that are graceful and able to transmute the pain of the past and move us into the future with clarity and creativity. The designer of this system, Rhianne Teija NewLahnd, is an author, artist, poet and spiritual counselor. She is an ordained Priestess in the Temple of Isis, Clonagal castle Ireland, a certified clinical hypnotherapist, a minister, Mariel practitioner, and high level intuitive. Come on a journey into your own heart and soul. Discover wonders and wisdoms you did not know you possessed. Come and find out what your higher self says about Life, and re-enchant any areas of your world that have become dis-enchanted, lack luster, worn out, unhealthy, unproductive and unfulfilling. You are a treasure chest of wonder, magic and beauty. Discover the gem that you are today, and if you already are in a good place in your life, discover an even deeper level of richness and magnificence, for there is no limit to our capacity for LOVE. Welcome to the Academy. We are here to bring "lightness", beauty, wisdom and wonder into your life. 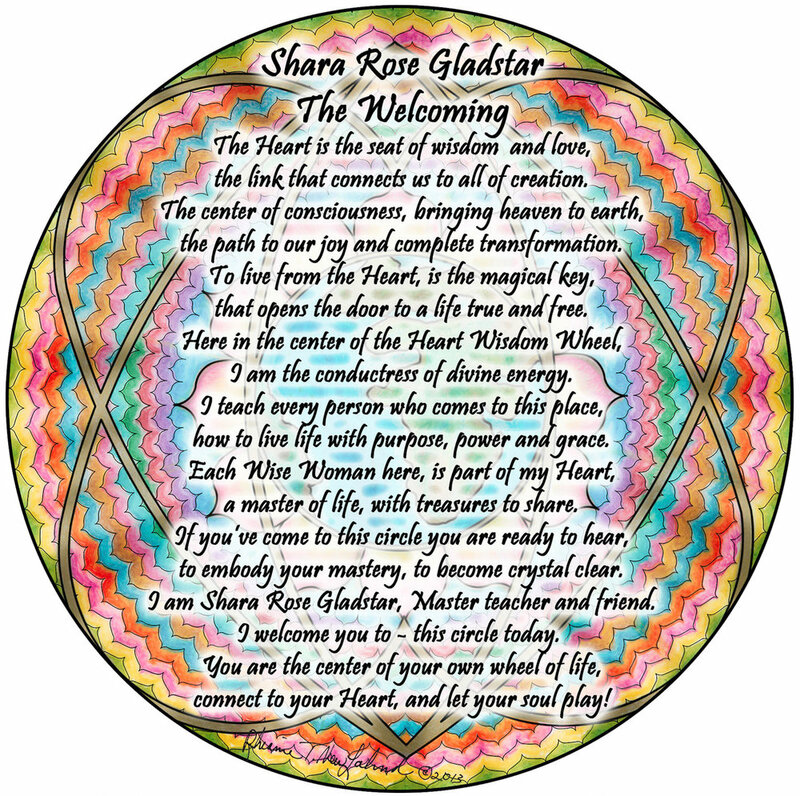 My name is Shara Rose Gladstar. I am the Master Teacher and conductress of The Enchanted Heart Wisdom Council. Our Council, which is comprised of 13(including me) amazing women who are ..
Sign up and join us as our amazing journey of the heart begins. You will be enchanted and delighted, as well as gracefully transformed into a more refined, beautiful, joyous, natural expression of your true essence. You have come here because you are ready to activate a level of magic and beauty that will take you to a higher level of expression, health, wealth and wonder in every area of your life. This is a test to see how it will look.  Your women guides have interesting and distinct personalities. It’s like you have a women’s group that meets on an aetheric plane. — Alicia Bay Laurel, author of best selling book "Living on the Earth", artist and musician. "Our true purpose is to love,cherish, enjoy, and be enchanted with LIFE.By holding this focus, we magically come into alignment with our higher selves.What could be better than that?" Card free when you sign up for our newsletter and updates. The course, DISCOVERING ENCHANTMENT, is coming this summer. Sign up here and receive a special offer and invitation. Become part of an amazing community of creative , intelligent, witty and wonderful women when you take part in our course, Discovering Enchantment.